Green infrastructure is an approach to water management that anyone can embrace which protects, restores, and/or mimics the natural water cycle and helps Charleston become more resilient. Green infrastructure focuses on collecting and harnessing rainwater on site at the source (where rain falls), instead of directing rainwater away from the built environment into drainage infrastructure. Green infrastructure is effective, economical, and enhances community safety, beautification and quality of life as it also protects water quality, and reduces runoff and the overall quantity of water entering and overburdening drainage infrastructure that was not sized many years ago for the extreme rain events Charleston is experiencing today. "To become truly rainproof, you need to improve the sponge effect of the city. That includes...the public and private spaces such as streets, gardens and rooftops" says [Amsterdam] Rainproof programme manager Daniel Goedbloed. There are many types of green infrastructure and best management practices Charlestonians could embrace to help make our community more resilient. A rain garden is a landscaped depression full of water-loving plants that absorbs excess rainwater. Rain barrels catch rainwater which would otherwise flow into drainage infrastructure and over dirty streets. Rain gardens work well paired with rain barrels. Like rain gardens, a cistern can catch rainwater which would otherwise flow into drainage infrastructure and over dirty streets. Rainwater harvesting not only collects water, but also stores it to allow for reuse of the water when needed. Permeable pavements aim to infiltrate, treat, and store rain where it falls. Permeable pavements include a variety of product types that provide feasible alternatives to standard impervious concrete and asphalt. Permeable pavements include: pervious concrete, porous asphalt, permeable pavers (interlocking or non), pre-cast blocks, cast on site reinforced concrete systems with large voids, and plastic systems. Trees slow down rainwater with their leaves and branches, reduce erosion with their roots, and can absorb and store a massive amount of rainwater, reducing the amount of rainwater entering and overburdening our drainage infrastructure. Green roofs are vegetated rooftops that consist of waterproofing and drainage mats, a special growing media, and plants able to withstand an extreme rooftop climate. Vegetation and growing media provide storage capacity and evapotranspiration of stored water. 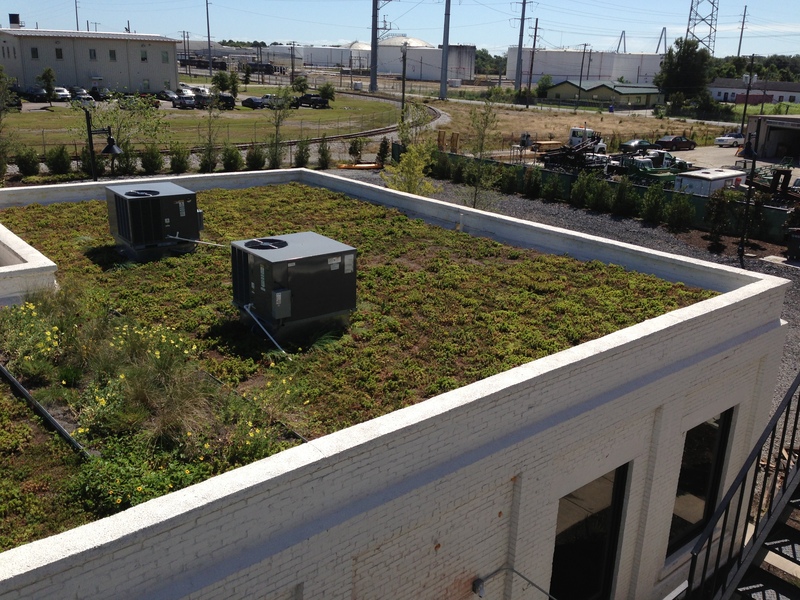 While not considered green infrastructure, blue roofs can be coupled with green roofs or act independently and provide stormwater detention on a roof. This creative storage capacity is particularly useful in urban settings with limited available land. Cool roofs, while not a stormwater management practice, are often designed with light colors that reflect sunlight and the sun's energy instead of absorbing the sun's heat. This simple change in a roof color can save homeowners money with lower cooling bills during hot summer months. Bioswales are often linear features that direct and convey water elsewhere as they also slow, filter and store rainwater. Most downspouts are connected to drainage infrastructure which can become overwhelmed during heavy downpours. Downspouts can be rerouted to fill rain barrels or to permeable areas capable for infiltrating more water to reduce the amount of water entering our drainage infrastructure. Vegetation can slow down rainwater, reduce erosion, and can absorb and store rainwater, reducing the amount of rainwater entering and overburdening our drainage infrastructure. Native plantings have adapted to survive and evolve in place, making them suitable to existing soil, water and sunlight conditions. Often native plantings don't require additional irrigation, fertilizer or pesticides to keep them alive because they are already so well adapted to the climate and weather conditions where they naturally grow. Vegetative buffers are strips of land with vegetation growing that are designed to intercept and filter stormwater pollutants and minimize erosion. Buffers are an effective method of protecting sensitive habitat, reducing pollution in stormwater runoff, reducing erosion, and more, and are critically important in protecting tidal creeks. There are regulations in place to protect the salt marsh, so understanding local, state or federal authority is important. LEARN MORE from Amsterdam! Learn how Dutch residents, businesses, organizations and government are all working together in Amsterdam to collectively "rainproof" their city.